Here’s how to add a breadcrumb provided by the Yoast SEO plugin to any page of your site using a Beaver Themer Part-type layout. Enable Yoast breadcrumbs by clicking SEO > Advanced on the WordPress admin panel, then on the Breadcrumbs tab click Enabled in the Breadcrumbs settings section. 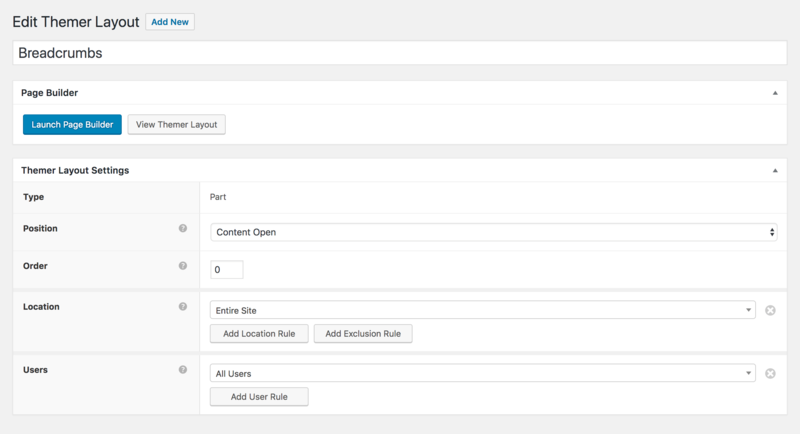 On the WordPress admin panel, click Builder > Themer Layouts. Create a new Themer layout, and for Layout choose Part. For Position choose where you want the breadcrumb to be located. In the following screenshot, the position has been set to Content Open, which means this part will appear at the top of the post or page content area. For Location choose which types of pages you want the breadcrumb to appear on. The Yoast breadcrumb should now appear in the location you specified.